Common Names: Mother of thousands, Flaming Katy, piggy-back plant and life plant. Best Temperature: Allow cool temperatures of 50º-60ºF for the flower blooms to appear in the fall but otherwise, keep warm. Water and Humidity: Let the soil dry between watering. Growing Guidelines: Use an all-purpose soil with added sand for drainage. Fertilize with fish emulsion once a month while they are blooming. Common Pest Problems: Aphids and Mealybugs. Propagation: Stem, cuttings, seed and from leaves. Comments: It can be difficult to get them to bloom more than once, or depending on the species, it may die after blooming. Kalanchoe, also written Kalanchöe or Kalanchoë, is a large genus of about 125 species of tropical, succulent flowering plants in the family Crassulaceae and has a very wide distribution area. Only one species of this genus originates from the Americas, but there are 56 from southern & eastern Africa and 60 species in Madagascar. It is also found in south-eastern Asia until China. Most of the species interesting to collectors are coming from Madagascar or South Africa. These species are generally subshrubs with succulent leaves. 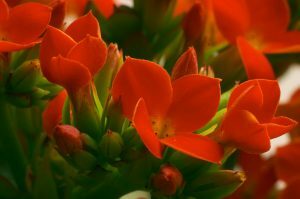 The name Kalanchoe came from the Chinese name “Kalanchauhuy”. Most are shrubs or perennial herbaceous plants, but a few are annual or biennial. The largest, Kalanchoe beharensis from Madagascar, can reach 20 feet tall, but most species are less than 3 feet tall. Everyone pronounces it differently and nobody knows exactly who’s right. Flowering Kalanchoe is a cousin to the Jade plant and a fairly low-maintenance succulent commonly grown as a houseplant or greenhouse plant. 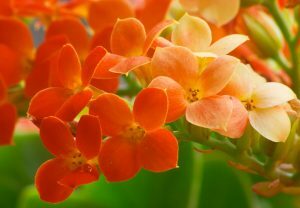 Flower heads on kalanchoe blossom in bright oranges, pinks, yellow, red and white on a compact, upright plant about 6 to 12 inches high. The flowers will last anywhere from 3-6 weeks, and the foliage is attractive and shiny green all year-round. K. blossfeldiana flowers in late autumn to early winter. Kalanchoe blossfeldiana is the most common variety of kalanchoe, also known by the English common names Flaming Katy, Christmas Kalanchoe, Florist Kalanchoe and Madagascar widow’s-thrill, but there are many varieties to choose from, including pendant (hanging) varieties and nonflowering varieties grown for their unique foliage. All kalanchoes have the same growing requirements. It is a popular plant during Chinese New Year celebrations, as it is said to bring wealth and prosperity. These plants are cultivated as ornamental houseplants and rock or succulent garden plants. This plant is known to the Chinese as “thousands and millions of red and purple”. Some species contain toxins that can cause cardiac poisoning in grazing animals. The plant has been used in traditional herbal medicine to treat infections, rheumatism and inflammation. Kalanchoe extracts also have immunosuppressive effects. Kalanchoe pinnata has been recorded in Trinidad and Tobago as being used as a traditional treatment for hypertension.